Bio: Ray Hassard was born and raised in the New York area. He studied advertising design and visual communication at Pratt Institute, and, more importantly he says, spent hours and hours at New York's wonderful museums and galleries. Ray teaches pastels at Baker Hunt Art and Cultural Center in Covington, Kentucky, and leads workshops around the country. He belongs to the Pastel Society of America, the Indiana Plein Air Painters Association, and is a signature member of the Cincinnati Art Club. 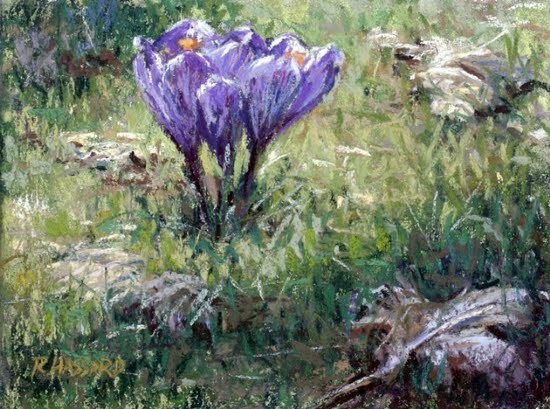 He was awarded signature and Master Pastellist status by the Midwest America Pastel Society in 2008, and serves on the Board of the Ohio Plein Air Society. He was awarded First Place in the 2008 Pastel 100, in the Landscape and Interior category. Besides art, Ray's major interests include contra dancing, roller coasters, and travel. He has visited over 75 countries, with India being his favorite. Gallery: Recent Works (69 paintings spread over 4 pages); Figure Drawings; Archives (44 paintings spread over 3 pages); India and Bhutan (46 paintings spread over 3 pages). Image View: Thumbnails are labelled with medium and dimension as a tooltip when the cursor rests on the image. These open in a slideshow on a new page, and contain information and maybe notes on the work. Clicked again, they open again even larger in a new pop-up. They may be saved. Under the Pergola – Spring! is 6x8 ins, and a high-resolution 250 KB.